Jefferson Salamander, found in some parts of North America, is a mole Salamander, involved in a hybrid complex with Blue-spotted Salamander and Small-mouthed Salamander. True Jefferson Salamander tend to be slightly longer. People often mistake Jefferson Salamanders for lizards. Jefferson Salamander was first found in the 1800s. It was named after Jefferson College in Pennsylvania. The name indirectly honored Thomas Jefferson, the renowned naturalist and the third president of the United States. 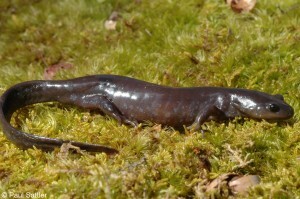 Size – Jefferson Salamander is thin and long. The size of an adult Jefferson may be around 10 – 12 cm. At times it can grow up to 17 cm. Color – The color of this species may vary from grey, dark brown, brown, brownish grey, slate grey with bluish touch on the sides of its body though many individuals are devoid of this bluish spot. The vent region is grey in color. It has a flat wide nose and relatively long legs, which sets it apart from other Salamanders. The tail is vertically flattened. This species is primarily found in some parts of North American continent. In the United States it ranges from southern New England, southwest through Indiana, Kentucky, Virginia and west to Illinois. In Canada it is found in Niagara Escarpment, the southern part of Ontario and the western part of Oak Ridges Moraine, north of Toronto. Jefferson Salamanders are selective about the place where they live. Its hard for this species to pick a new place for living and this makes their life so vulnerable. Jefferson Salamander prefers undisturbed wild or semi wild moist woodlands and well drained upland forests. This creature is partly nocturnal. Outside its breeding season it spends most of the time by hiding in the ground, under leaf litter, or staying under debris near pond or marsh. Around 40 -50 percent members of this species die in hibernation as they spend their time in areas that are too cold for survival. The most distinct feature in its character is its stubbornness to move from one area to another. It is so stubborn that it may not move more than a mile in its lifetime. When attacked by a predator, it defends itself by different kinds of tail movements and body posturing. This creature produces toxic ooze from its skin glands, which is at the base if its tail. At times it will curl its head under the tail to form a coil. It is known to live around 5 – 7 years, though it may go up depending on the condition of its habitat. It feeds on beetles, worms, spider, snails, insects, centipedes and other invertebrates. The larvae feed on zooplanktons and aquatic invertebrates. It is one of the earliest breeders. Mating happens once in a year, generally starting from late March to April. Jefferson Salamanders migrate to ponds, swamps for breeding. It is reposted that females may skip one or two years before it breed again whereas males breed every year. Females start to lay eggs after 2 – 3 days from mating. Females lay around 5-50 per clutch. In one breeding season females may lay around 100-250 eggs. The eggs are attached to vegetation, and sizes around 2 – 3 mm in diameter. The length of incubation may take 3 – 12 weeks depending on temperature and natural conditions. Newly hatched larvae can be up to 1.5 cm in length in size. It is dark in color with a broad head. The larvae generally feed on aquatic invertebrates. The larvae transform itself into a terrestrial salamander within around three months. Fully transformed individuals sizes around 4.5 – 5.5 cm. It takes two to two and a half years to reach sexual maturity. Jefferson Salamander, Just like the Blue-spotted salamander, also produces triploid offspring when these two species interbreed.These offspring are more spotted and smaller than the true Jefferson Salamander. Its predators include variety of animals like owl, snakes, raccoons etc. The eggs and the larvae of this creature are particularly vulnerable due to predation, especially by aquatic invertebrates and other ferocious predators. This creature is very hard to spot as it likes to stay in hiding in semi wild places. The migration to their breeding area is usually done during or right after heavy rainfall. Its breeding pools may be few hundred meters away from its forest home. When threatened, Jefferson Salamanders can shed its tail voluntarily. The muscles in the detached tail twitch, that distracts the attacker and gives it a chance to get away. To protect this species, one must protect the wetlands, which is its habitat. 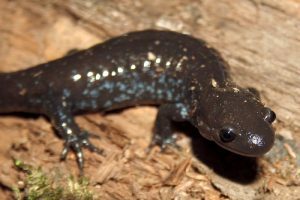 Jefferson Salamander is not listed among endangered species. Habitat loss is the biggest threat to the survival of this species. The biggest threat to this creature is the expansion of cities, as it is losing its habitat and especially its breeding ground. During migration a large number of Salamanders killed by cars and other automobiles on the road. In some isolated pockets the tiny population of this creature is threatened due to natural disasters and catastrophes. Overwintering, in few places, is also a huge concern. Since both provincially and nationally it is considered as a threatened species. Its our job to protect this species because Jefferson Salamanders are an indicator of healthy environment. The disappearance of this species from its habitat may be the hint of pollution. We must stop deforestation and start protecting seasonal ponds, to save this species. If we maintain its habitat in our property, that can also help the survival of this species. More than that we must make people aware of the importance of this species and start new projects to save Jefferson Salamanders. 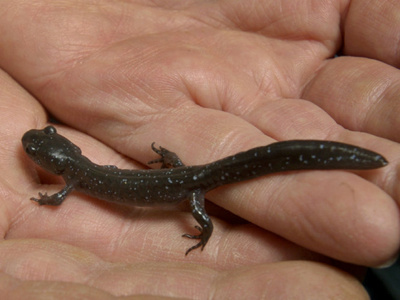 Jefferson Salamander is listed as threatened by The Committee on the Status of Endangered Wildlife in Canada. According to Ontario’s Endangered Species Act (2007), killing, capturing, trading of this species is prohibited. The population of this species receives protection in Conservation Areas and Provincial Parks. I don’t know if they are poisonous but I’ve had one for a day and and it seems to make a pretty good pet. You can hold it but not so much that it dries out it’s skin, it needs water and also needs to be in a moist area if possible I think. I found a Jefferson salamander this evening outside my house in South West Ohio (close to Cincinnati) hibernating under some leaves. We are about 200 yards from a pond which I suppose would be where it lives or breeds. Thanks for the photos and information that helped me identify it. i found a Jefferson salamander out under my shed and i kept it and my lil brothe screamed owww can they bite?